Chart No. 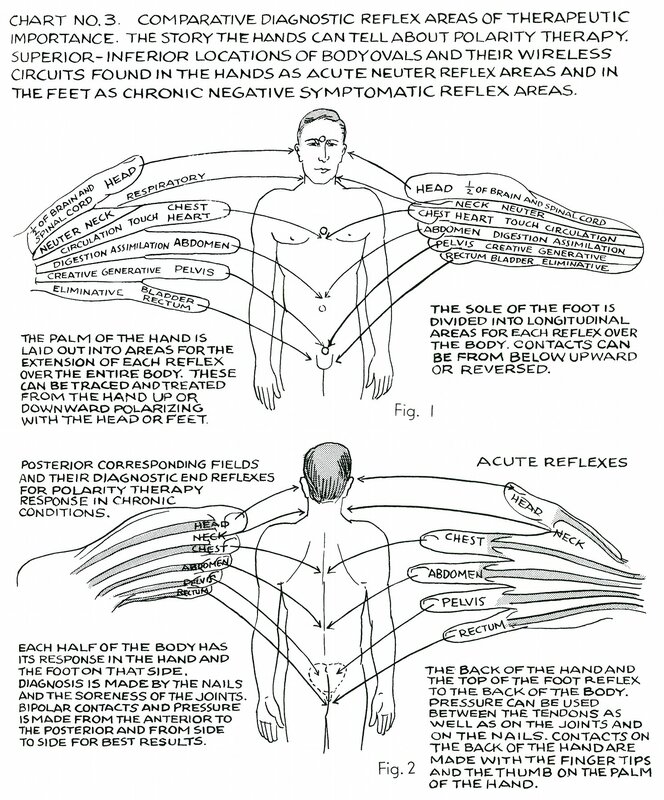 3 - Comparative Diagnostic Reflex Areas of Therapeutic Importance. The Story the Hands Can Tell About Polarity Therapy. 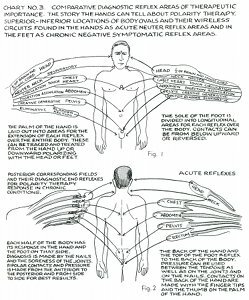 Superior-Inferior Locations of Body Ovals and Their Wireless Circuits Found in the Hands as Acute Neuter [Neutral] Reflex Areas and in the Feet as Chronic Negative Symptomatic Reflex Areas. 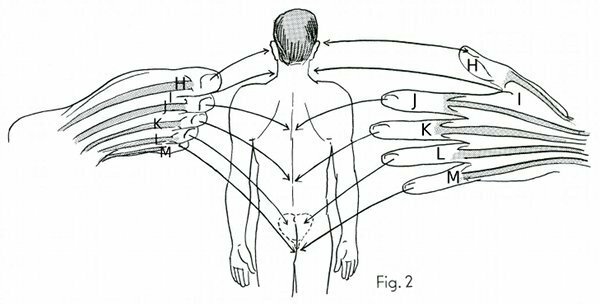 The palm of the hand is laid out into areas for the extension of each reflex over the entire body. These can be traced and treated from the hand up or downward polarizing with the head or feet. The sole of the foot is divided into longitudinal areas for each reflex over the body. Contacts can be from below upward or reversed. Posterior corresponding fields and their diagnostic end reflexes for polarity therapy response in chronic conditions. Each half of the body has its response in the hand and the foot on that side. Diagnosis is made by the nails and the soreness of the joints. Bipolar contacts and pressure is made from the anterior to the posterior and from side to side for best results. The back of the hand and the top of the foot reflex to the back of the body. Pressure can be used between the tendons as well as on the joints and on the nails. Contacts on the back of the hand are made with the finger tips and the thumb on the palm of the hand. Book 3, "Explanation of Chart No. 3"